Ionic capital. Nahāvand (anc. Laodicea), Hamadān province, Iran. Hellenistic period (330-ca. 150 BC). Excavations of M. Rahbar (Iranian Center for Archaeological Research, ICHTO), 2005. Ḥammām-e Ḥāǰǰ Āqā Torāb Museum. H. 0.265 m, W. 0.735 m.
The limestone capital was discovered in 2005, during the first season of the archaeological investigations undertaken by Mehdi Rahbar (Iranian Center for Archaeological Research) within the residential area of Doḵaharān in the northwestern corner of Nahāvand (Rahbar 2005; Rahbar and Alibaigi n.d.; Rahbar 2008: 368 fig. 1, 371; Rahbar and Alibaighi 2009: fig. 6; Rahbar et al. 2014: 307, pls. 1 [location photographs], 10, 11). The aim of the investigation was to locate the main temple of the hellenistic city of Laodicea in Media, whose existence in this area of Nahāvand was attested since the mid-1940s by a chance find: an inscribed stele, which preserves an edict of the Seleucid ruler Antiochus III (223-187 BC) addressed to the Laodiceans, and which was erected initially, as we learn from the inscription, in Laodicea's 'most prominent sanctuary'. Finds, known since the 1940s, from the same spot include another inscription of Seleucid date (e.g., Robert 1950: 73-75, pl. XXIII; Rougemont 2012: no. 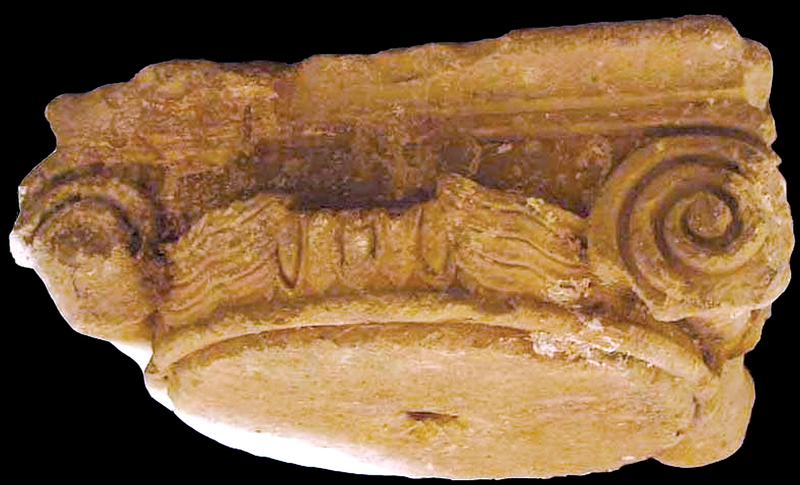 67), a cylindrical stone altar, dated to the third or the second century BC and measuring 0.90 m in diameter and 1 m in height (Ghirshman 1962: fig. 24), and a number of stone columns. Six columns reportedly lay in the ground around the beginning of the 20th century; a (seventh?) shattered column was seen by Roman Ghirshman during his brief visit to the site following the stele’s discovery (Ghirshman apud Robert 1949: 21). The columns are not described or illustrated. Ghirshman considered that they belonged to the hellenistic temple mentioned in the inscription of the stele (Ghirshman apud Robert 1949: 21). The search for Laodicea's 'most prominent sanctuary' since 2005 has proven to be a difficult task, and the connection of the present Ionic capital with this sanctuary remains a moot point. In the area under investigation (Rahbar et al. 2014: plan p. 305 fig. 2), in addition to the Ionic capital (and the columns reported in the 1940s? 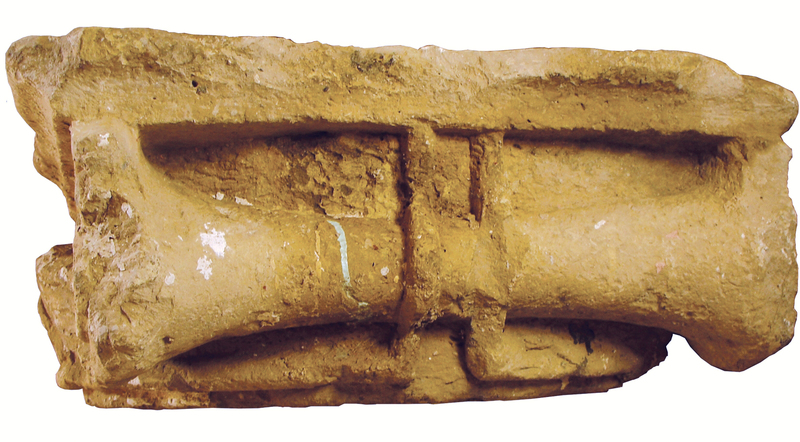 ), architectural remains of possibly hellenistic date include a number of column bases and shafts (Masoumi 1978 and Rahbar et al. 2014: 304, pl. 12 no. 4; Rahbar and Alibaigi 1390/2011; Rahbar et al. 2014: 307-309, pls. 12 no. 5, 13, 14). These were found dispersed, often in secondary use, and it is not clear if they come from one or more (Hellenistic or Parthian period?) structures. Equally, when recognizable, Seleucid and Parthian layers were extensively perturbed by later Islamic occupation, and it has not been possible so far to pick up any clear traces of Seleucid edifices in the ground (Rahbar et al. 2014: 309). Alibaigi, S. 1392/2013. 'Yaddāshti darbare-ye sofal-e zarife manqush-e dore-ye Sloūki / avāyel-e Ashkāni, Mohavate-ye mosoum be Mabād-e Lāodise dar Nahāvand’ [‘A note on Seleucid/Early Parthian period festoon ware from the site of the so-called Laodike temple in Nahavand’]. In Rahmani, E. and Khaksar, A. (eds. ), Essays on the History and Culture of the City of Nahavand Presented to Mehdi Rahbar (9 February 2014), edited by Azndaryani, E. H. Tehran: 212-227. Masoumi, Gh. 1978. ‘Gozaresh-e gamane zani dar Nahavand, markaz asnad sazman miras farhangi, sanaye dasti va gardeshgari’ [‘Report of the excavation in Nahāvand, Cultural Heritage Handicrafts and Tourism Organization Archive’]. Unpublished report prepared for the Iranian Center for Archaeological Research. Rahbar, M. 2005. ‘Gozāresh-e Barresi va tafsire Mabād Lāodise Nahāvand’ ['Report of the investigation and interpretation of the temple of Laodicea, Nahavand’]. Unpublished report prepared for the Iranian Center for Archaeological Research. Rahbar, M. and Alibaigi, S. n.d. 'Report of the investigation of the location of the temple of Laodicea, Nahavand' [in Persian]. Unpublished report prepared for the Iranian Center for Archaeological Research. ——. 1390/2011. ‘Gozāresh-e pāzuhsh-ye Bāstānshenākhti be manzoure makan yabi Mabād-e Lāodise dar Nahāvand’ [‘Report of an archaeological investigation for the location of the Laodice temple in Nahāvand’]. Majalle-ye Payam-e Bastanshenas 15 (spring-summer): 133-60. Robert, L. 1949. 'Inscriptions séleucides de Phrygie et d'Iran.' Hellenica VII. Paris: 5-29.